I don’t just love sewing and making clothes. I love fashion, the design, the styling and all that goes with it. I am one of those people glued to the screens when the biannnual fashion weeks are on, watching for what’s next on my list to make! So when I came across Trend Patterns at the Knitting and Stitching Show a couple of weeks back, I fell in love with everything they’re about! Ultra modern, trendy designs, it’s all right up my street! I love that this was a brand that’s not afraid to be daring and bold. I was so impressed that I approached Lucy for a little interview which she very kindly agreed to! So let’s start from the beginning – tell us a bit about yourself and your background! I have loved sewing and making things for as long as I can remember, so I always knew that I’d be in a creative job for the rest of my life from a young age. I have worked in the Fashion Industry for over a decade now, Pattern Cutting for top London designers, putting together some incredible iconic pieces. Why/ how did you decide to get into making patterns for the home sewist from working in the high fashion industry? A friend of mine actually pushed me in this direction when we were having a discussion (over a bottle of wine) about what we wanted to do with our lives (lol). I had wanted to start up my own “thing” for a while, but didn’t want to be a designer, didn’t want to leave Fashion, and I didn’t want to stop pattern cutting. It wasn’t until a year later that I decided what I wanted to do, and then I planned for another year, I can be very indecisive and sit and think for a long time before I strike. But this is actually a really natural and perfect business idea for me, so I am definitely doing this with a lot of love. I follow fashion week every year and I’m always overwhelmed with the amount and variety of styles and trends that come out! How do you pick out what trends to follow? Who do you design for? Do you have a person in mind that’s going to want to buy, make and wear your designs? I wouldn’t say I have a particular person in mind. I guess you could say I design for myself and my friends, or anyone similar to us that longs for an interesting covetable designer wardrobe. And those who love to create. You could also say I’m designing for current and future sewers too, I want more people to enjoy sewing and creating so if I’m encouraging people to take up a hobby, or to develop existing skills, then that makes me happy. What’s your personal style like? Do you find this influences your choices and what trends you pick out? This is a difficult question- I don’t know if I have a particular style. I like a lot of black that is for sure! I go through phases between dresses or trousers very often. My Mum would always remind me that I did this regularly when I was a child too. I would refuse to wear the other depending on the phase I was in. So much so I would tell her to throw the other away because I would never wear it again. Now I never throw anything away! I don’t think I would work on something I didn’t like, and I would really struggle if I didn’t like the trend at all. So there is an element of influence there, but not dependant on if I would wear it. What’s your design process like? Do you do lots of draping or draft straight onto paper? Is it a long process? It depends on the pattern I’m working on. I think there are certain things you would drape and certain things you would work flat (straight on paper). I mainly work straight onto paper though. When I’m planning my designs I will study a few key looks and/or details relating to a trend that I’ve selected, either my favourites the most iconic, and then combine and “redesign” to achieve something of my own. Then I will toile and alter as many times as it takes until I think it’s perfect, maybe up to three times. The length of time it takes me is all dependant on the item, if I’m focused and know what I want I can get something done in a day or two. If I’m not focused I might even set something aside and go back to it at a later stage. I have patterns that I set aside back in December that I still haven’t returned to but I’m not giving up on them just yet. 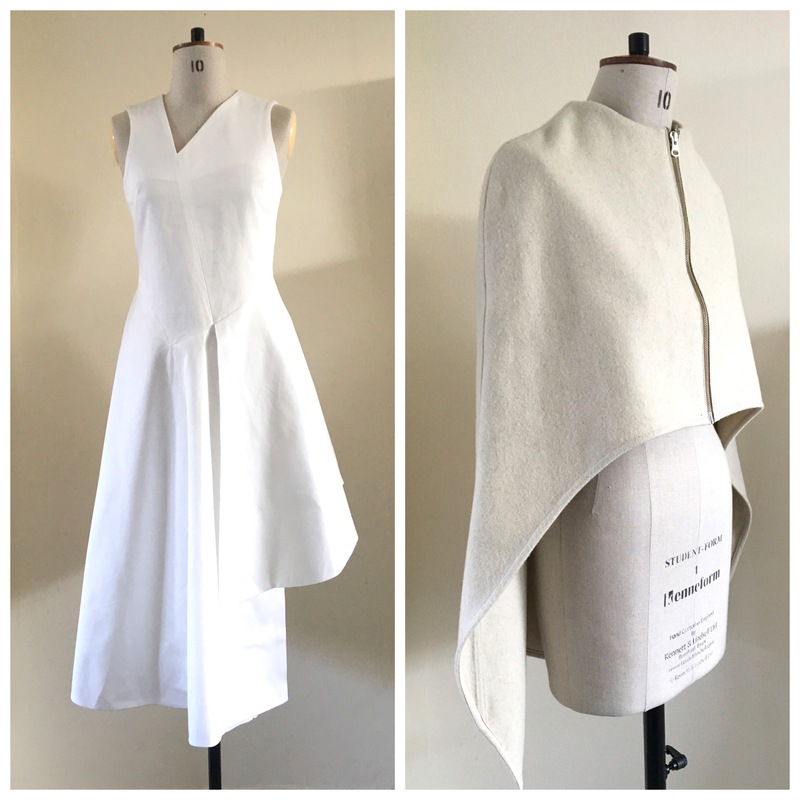 Personally I think it’s not unreasonable to pay more for a gorgeous, well designed piece – £30 for a pattern + fabric costs is going to be less than the hundreds you could be paying for the RTW designer one. Plus I can make myself lots of different versions! But there are those who might have concerns about the higher end price point of your patterns compared to others. What would you say to them? I think you hit the nail on the head within your question. I’m producing something that is high-end fashion industry standard – not high street, not fast or disposable fashion. My patterns are based on garments that are a minimum of say £500 up to thousands. If you choose the correct fabrics and you make it more than once you have a life long bargain. But it’s not only that, I’m sure the majority of the community aren’t bothered about a £2000 dress. So then I would say that my patterns are unique, well detailed and constructed, not simple or standard wardrobe staples. And I will continue to produce new exciting patterns every season. What’s your favourite pattern you’ve made so far and why? I couldn’t possibly choose one, that’s like asking a mother who their favourite child is (lol)! But right now I’m loving The Bomber TPC4 for its sleeves, volume, comfort. I made mine with a fleece lining so I literally want to go to sleep in it every time I put it on – it’s so cosy and the sleeves are so cool. And the Asymmetric Hem Dress TPC2 is also super comfortable so I’ve worn it to work a lot. Oh and the Pleated Front Trouser TPC6, I think I’ll be living in them all summer. Do you do a lot of home sewing yourself? What’s the last item you sewed for yourself? And what’s next on your sewing list? I went through a phase of not wanting to pattern cut or sew at home because working towards fashion week can be so stressful and draining, mentally and physically, that I couldn’t have thought of anything worse. But I constantly did my own alterations as nothing I buy ever fits me, and loads for my friends too. Now I’m sewing loads again, constantly toiling the patterns until they’re right, making final samples, and then making my own version. The last thing I made was TPC5 Frilled Hem Top in a black light weave with a contrast satin frill – I love it and it’s black so suits me perfectly. I have bags of ready cut pieces waiting to be made that I don’t know when I’ll get round to them, and fabrics allocated to patterns that aren’t cut yet. But top of my list is a new bomber for spring without a lining, well actually I also want to make one in a black wool so that’s two things! 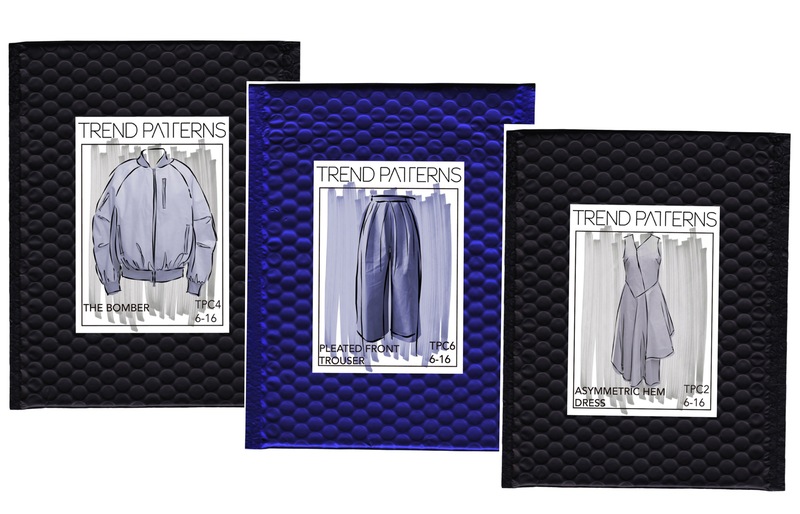 What’s coming up next for Trend Patterns? Spring Summer 17. I’m trying to narrow down to an achievable amount of patterns but there are so many dresses I want to do that I’m kind of out of control at the moment! Hopefully these patterns will launch at some point towards the end of April. A massive thanks to Lucy for joining me on my first foray into journalism. I loved finding out more about you and your company! I’m currently working on my own version of the Frilled Hem Top TPC5 that I literally can’t wait to finish and show you all! I had not heard of this pattern company either, some of the designs look great and well thought out but they are out of my budget, I don’t get much to spend on sewing at the moment (children!) so this price often includes a pattern and fabric but maybe if it was a super duper one I could stretch. 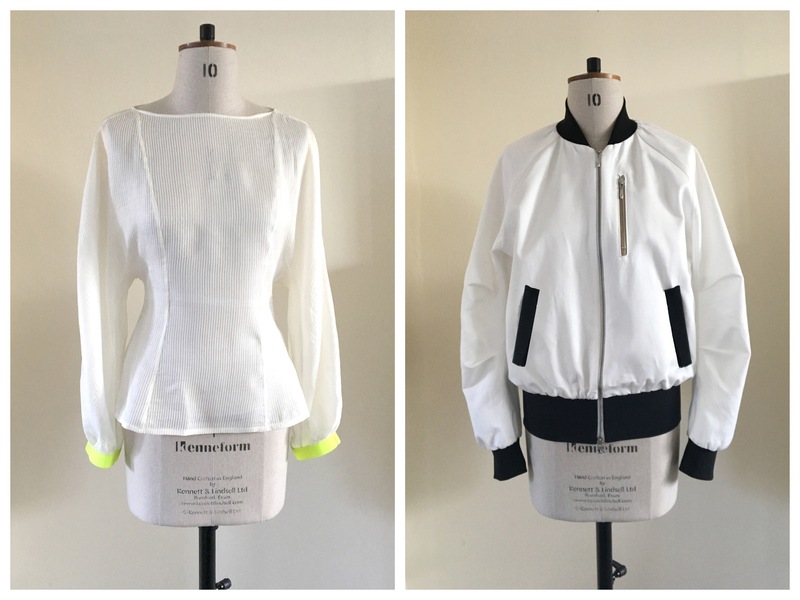 Pingback: The Frill Hem Top - Trend Patterns - Self Assembly Required!